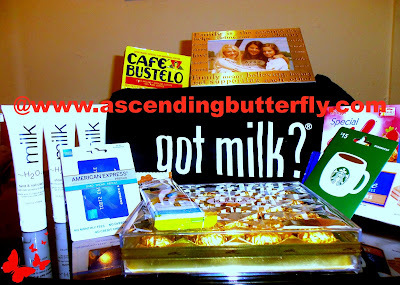 Ascending Butterfly: Weekly Moment of Gratitude, Winners Announcement and an AwesomeSauce #Giveaway! Weekly Moment of Gratitude, Winners Announcement and an AwesomeSauce #Giveaway! Ƹ̵̡Ӝ̵̨̄Ʒ - Events! - I have attended some great events (and some not so great ones too!) that I will recap soon! As a former Events Planner these are all wonderful learning experiences that's for sure! Ƹ̵̡Ӝ̵̨̄Ʒ - My Disconnect Time! - Trying to actively give myself more time to de-compress, which I definitely need. I have been keeping my own daily list of things I am grateful for and taking time to acknowledge my blessings daily. A bit of concentrated focus on what you do have, instead of on what you lack or need, can make a huge shift in your life! What are YOU most grateful for today Butterfly? Ƹ̵̡Ӝ̵̨̄Ʒ - Congrats to Jackie P. and Dana R., our two winners in the Got Milk? Prize Basket Giveaway! Your awesome Gift Basket and American Express & Starbucks Giftcards are on the way! First of all Congrats to Jackie P. and Dana R. I'm really grateful for spending time with my daughter ( (knowing that she is strong and capeable of taking care of herself ) and laughter great stress relief plus brings friends and family closer together ! !